Well, the future of screencasting is already here. Internet time stuff, eh? We talked about it, so then Raymond and I went and did it. We've created two separate screencasts: his and mine. As you see there are two screencasts containing common clips (each refer to each other's) but they are two different end productions. These are screencast mash-ups of a rather self referential ilk. We swapped these files, and then created our own mixes. For my movie I created another short clip to explain what we had done. In Raymond's he added text frames. As I write I believe he is doing a Norwegian voiceover over one of the movies. 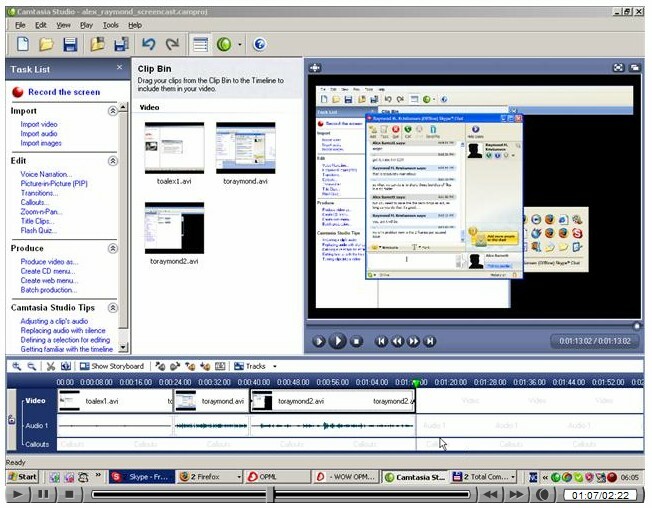 We've both also published their respective CS and .avi files (as .zips) (his .zip and mine .zip) which means anyone else can now reuse, edit, mix, mash-up our screencasts and create new remixed screencasts. All we ask is if you do join in (please do), that you also make the source files available so anyone else can remix again (specifically as movie file(s): .avi, .wmv, mp4, or sound files). Thanks for putting in that hard work, so WE don’t have too! I can see your project growing into a "video wiki" at some point.